My friend Gordana just returned from Germany. And it's October!!! She smuggled out two tins and I rounded up the beers. Octoberfest officially ended yesterday, so I'm going to try and catch up real quick. 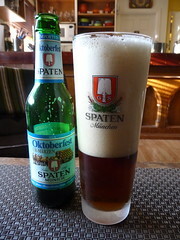 I'm starting with a Spaten Oktoberfest Ur-Marzen (labeled a malt liquor! ), while I roast beets. 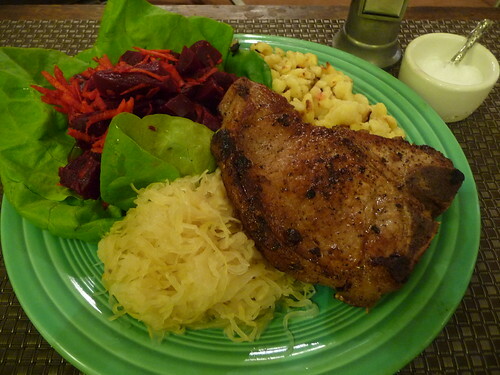 We are having pork chops, Hengstenberg sauerkraut, Maggi spaetzle, and roasted beets and carrots with butter lettuce. 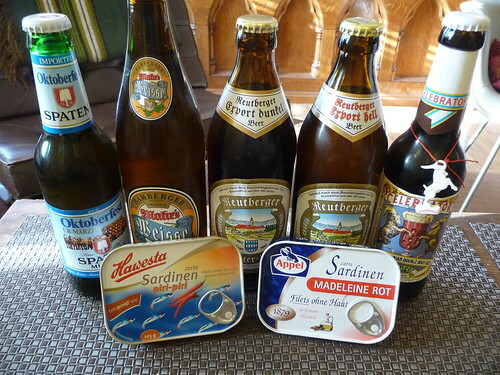 I have a selection of German beers, including a Celebrator Double Bock. Also grabbed a Clean Slate Riesling from Mosel, Germany for the Wife to dent. Tonght's tin is Appel zarte Sardinen MADELEINE ROT Filets ohne Haut in feinem Olivenöl. According to the website, Appel has seven different tins available. One is Piri-Piri. The other six include, Provence, Toscana, Cicero, Rosalinde, Madeleine grün, and tonight's tin: Madeleine rot. Those sound pretty good, Provence (in feinem Olivenöl mit aromatischen Kräutern der Provence und Knoblauch verfeinert), Tuscany (mit Olivenscheiben, Basilikum und Oregano)(these sound like the French tins we've experienced)(these sound like what should be made available at $6 a tin using fish caught politically correctly off the Coast of California, tinned locally using small bits of artichoke from the Salinas Valley, and a bit of goat cheese from Humboldt), I can't read the website, and am too "busy" to translate but this tin is zarte Sardinenfilets ohne Haut, in feinem Olivenöl, führende Fischqualität - fangfrisch verarbeitet, and Sardinen von Appel - "Klassiker" seit über 100 Jahren. Guess I'll learn more when I pop that zinn. 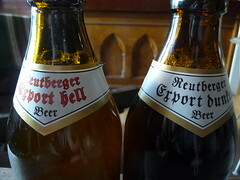 While I cook up a spicy smoked beer sausage for the platter, I'm moving on to the Klosterbrauerei Reutberg Brothers of Dunkel (5.2) and Hell (5.1). Start with Hell I guess. 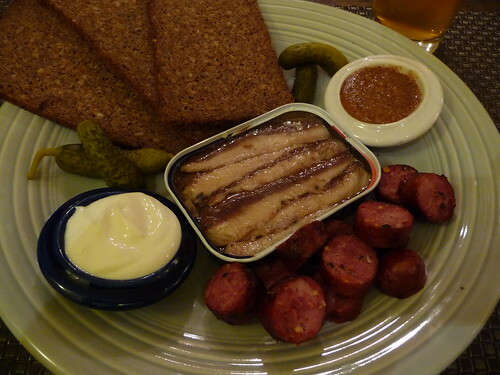 The Tin, sausage (Berkeley Bowl), Mestemacher rye bread, Hengstenberg cornichons, Hengstenberg sweet mustard, and a ramakin of horseradish cream make up tonight's platter. Five or six beers, I mean fish. A very light pleasant oil. Very mild, letting the fish come through. A bit on the tuna side all in all, firm, mild, really nice with the rye and sour cream. A bit hearty and enjoyable. Better than average but not killer Killer. The mustard only worked with the sausage. Four out of Five Tins. With the platter I had the Mahr's Weisse (4.9). Saved the Celebrator (6.7) for the chop. "in high-quality olive oil, refined with aromatic Herbs de Provence and garlic." "tender skinless sardine fillets in high-quality olive oil, top quality fish--processed fresh from the catch. Appel Sardines - a classic for over 100 years."